Checking your oil Tank | Is your oil tank leaking? The time of year has come where many people turn up the heating and get their boiler fired up to its maximum as the colder weather arrives. This is also a time where many people check their oil tank level and condition of the tank, therefore this can be the time where cracks and slight leaks are noticed on the tank. Regular inspection of your oil tank can prevent any unexpected issues or stress over potential problems. We recommend checking your oil tank once a month. 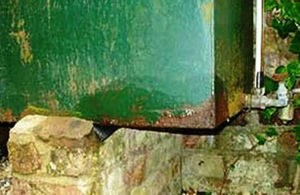 Early signs that a steel tank may be on its way out, are rusting along edges usually on the bottom of the tank, they rarely split suddenly but rather start with a damp patch that becomes a small pinhole over weeks/months. Plastic tanks can split and leak and early signs include deformation and/or hair line cracks along edges and seams. Regular checks of your oil tank can prevent any environmental issues and more expensive problems. See the UK.gov press release Press release Does your oil tank leak?